Icy Dock introduces the MB982IP-1S-1 2.5" SAS/SATA to 3.5" SAS SSD & HDD Converter. This product will start shipping on April 25th, 2012. In order to provide a pure 2.5" to 3.5" SAS conversion, Icy Dock is proud to introduce the new MB982IP-1S-1 2.5" SAS/SATA to 3.5" SAS SSD & HDD Converter. The MB982IP-1S-1 is an addition to the already popular MB982 enterprise series, with an emphasis on industrial level SAS storage applications. The dimensions, connection locations, and mounting hole positions are carefully placed to mimic a standard 3.5" SAS drive or SSD. The MB982IP-1S-1 also utilizes a full metal design, thus creating the best environment to cool any 10K, 15K RPM mechanical or enterprise SAS solid state drive, meanwhile, the rock solid construction is ideal for industrial, enterprise, and military related applications. A completely standardized SAS connection is implemented to be fully compatible with various backplanes that may be used. The converter is designed specifically to be used for 2.5" SAS/SATA drives that are required in 3.5" SAS internal hard drive bays of tower and rack mount chassis, as well as with backplanes or hot swap modules. 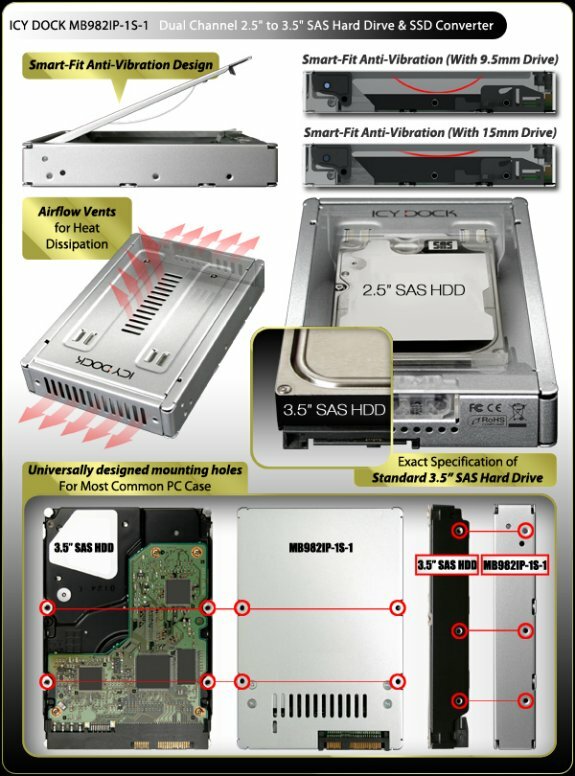 Converts your 2.5" SATA/SAS HDD or SSD to a 3.5" SAS HDD or SSD, for 3.5" SAS drive bay usage. Compatible with Most 3.5" SAS HDD Backplanes, Rackmounts and Hot Swap Devices. Designed for System Integrators and IT Professionals. Full Metal and Heavy Duty with Easy Access to Drives. Compatible with 15mm height drives. Airflow Vents for Heat Dissipation with Anti-vibration Design.